The sun was so kind to us this weekend... each day hit at least 60 degrees with endless blue skies! Lots of outside work (we had almost given up on) got checked off the list ... wahoo for cleaning gutters with kids! Don't worry they were on a side of the house where we only needed a short ladder/step stool. My 5 year old was so excited about the idea that she was REALLY helping. It was so nice to be battening down the hatches with enthusiasm not shivers. The children gathered kindling in short sleeves not heavy coats and mittens. We talked a lot about animals preparing for winter and how we were just doing our own kind of nesting... and then we magically found a little nest that had been abandoned before completion. And yes, there were some moments when bare feet were seen outside! I had been so ready to welcome the oncoming winter, but now I'm holding onto warm weather... just like this last magnolia leaf in the midst of bare branches. Luckily, I have some nice ways I'm planning on getting into the holiday spirit. And you can be certain that I'll be sharing them with you. Have a great start to your week! A November Barefoot Princess holding a nest. thank you for this lovely picture and post. Lila- thank you! 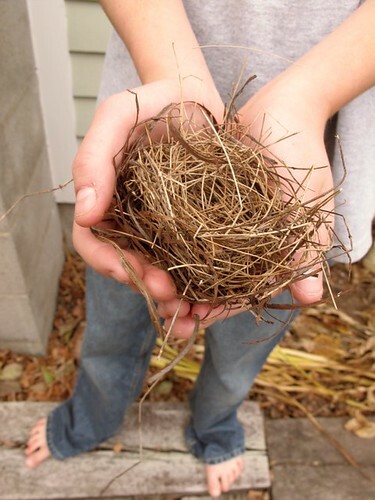 that would be my barefoot prince with the nest... just as beautiful;) no? Maryam- yes, we've loved watching them slowly fall. we have so many walnuts that are anxious to rid themselves of their summer "clothes" so we really enjoy how long those magnolias hold on. GREAT photo! What a weather! Such a lovely gentle post about moving with the seasons. Wonderful learning for your children. Sometimes we take these days for granted and forget that it is these ordinary days that become the fond memories that they hold dear once they have left home. Bare feet in November! I am a little jealous. The seasons always change but not always in the same way. 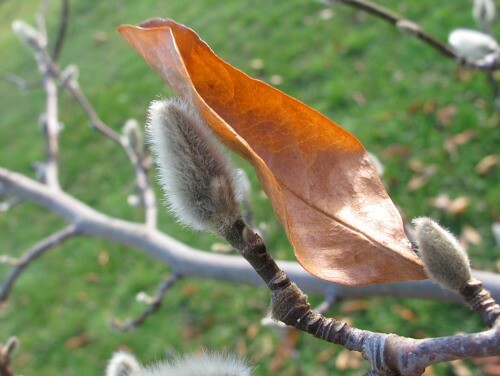 Hang on little magnolia leaf! When I was first over here there was a 'storm warning' on the local weather, so I rushed around putting away outdoor furnitures, securing windows etc. etc. And it drizzled. Gosh, it looks so warm for November. We're expecting snow tomorrow. That first picture is so cute it almost makes me want to cry. It was an amazing weekend- and WEEK :) Feeling grateful too. Thanks for sharing this post about some weekend warmth. It was nice to have a warm spell over the weekend. Winter will be here before we know it. I like this post especially in the nest.thank you for this lovely picture and post.